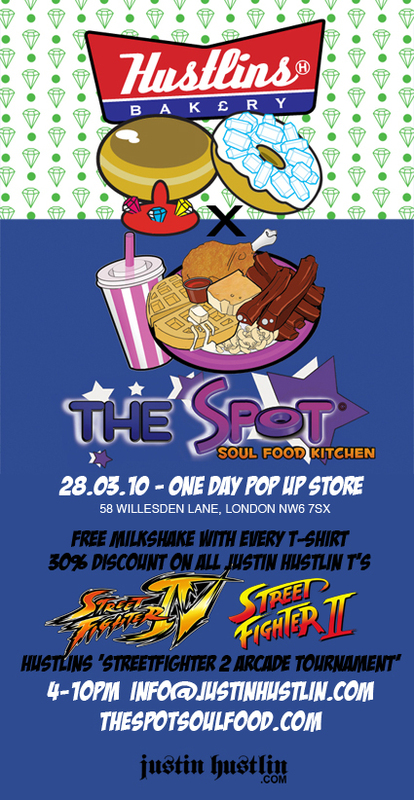 London brand Justin Hustlin will be hosting a one day pop up shop event in collaboration with The Spot, giving you a chance to pick up some reduced price items as well as some quality grub. The event takes place this coming Sunday, the 28th March, at The Spot soul food kitchen in North West London. Justin Hustlin items will be available at 30% off, and every T-shirt purchase entitles you to a free milkshake from The Spot, pretty good deal if you ask me. In addition, Justin Hustlin will also be holding a Street Fighter 2 arcade tournament, the winner of which will be rewarded with a free meal and T-shirt – more than enough incentive to come along. For more info on the event check out Justin Hustlin, and check out The Spot to find out what will be on the menu this Sunday.